Two years in a row this garden nursery has had this succulent and I really like it. It never flowered, just grew taller, but gave my planter an exotic look. 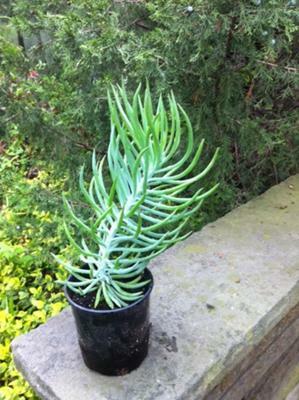 When I ask the nursery all they can tell me is "It's a succulent" which is obvious! Do you know what it is? I do indeed know what it is - it's one of my (and Brad Pitts) favorite succulent plants. He grows it in his garden looking towards the Hollywood sign, where it thrives in California weather, while here in Canada we use it as a summer annual. The correct botanical name is Senecio mandraliscae, and as far as I know, there is no common name except Chalk Sticks which actually refers to a different although similar plant. 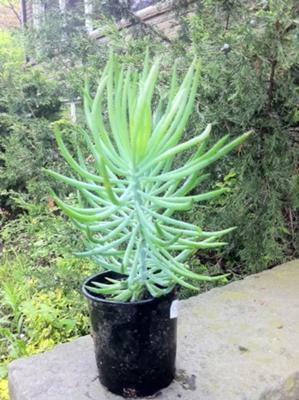 You can see more information about this great plant on miscellaneous succulent plants page. It will eventually bloom, but only with age. Unless you have a conservatory to keep it in for the winter, it takes longer than one season. The flowers will be the usual Senecio type, and resemble a daisy in form. It's easy to take some cuttings in the fall and overwinter them under lights and have them ready for spring planting in containers. 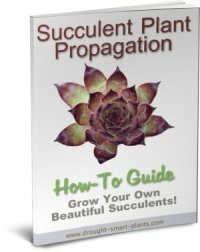 Wanting to learn more about Succulent Plant Propagation? Thanks, Jacki! :) Can I just grow it as a houseplant in the winter? That's what I do - I take cuttings of the stem, all the way down (just cut it into 3-4" long) and then let them dry. I pot them into flats or pots, dry well drained mix, water them once they've rooted. I put them under fluorescent grow lights for the extra light they need, and they're easy maintenance for the winter. Only water a couple of times throughout their winter vacation, they can live on very little moisture. The brightest light you can give them is the important thing. 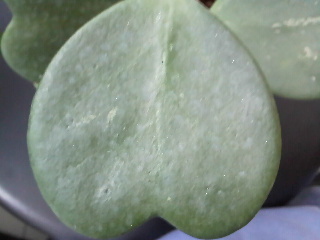 Hi Tammie, the heart shaped leaves are of Hoya kerrii, the sweetheart Hoya. You can see more about that genus here; Hoya.